Writer/director Adam Green is best known for the Hatchet films, where a monstrous slasher played by Kane Hodder destroys multiple people in every film. They're body count movies that basically serve as a gore showcase. Those are the flashiest movies Green has made, but Priscilla and I agree that the best movie he has ever made is Frozen, a simple story of three people sitting on a ski lift in the freezing cold. 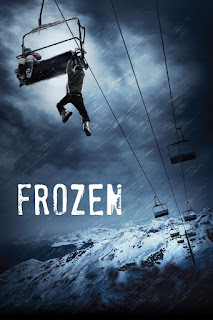 Frozen is one of my favorite horror movies from this decade. The acting, directing, score, and overall story all fit together perfectly to deliver a powerful, suspense-filled, incredibly tense and effective motion picture. Frozen centers on Parker O'Neil (Emma Bell), her boyfriend Dan Walker (Kevin Zegers), and Dan's pal Joe Lynch (Shawn Ashmore), and the first twenty minutes let us get to know the characters while they spend a Sunday skiing at a resort on snowy Mount Holliston. They haggle over the price of lift tickets, debate the merits of cigarette smoking vs. pot smoking, talk about whether snowboards or skis are better, and Lynch is revealed to be a bit of a chick magnet who occasionally seems to feel like the presence of Parker is dragging them down. Then the trio's fun day out turns into a nightmare when the lifts are shut down while they're still on a chair, leaving them stuck several feet off the ground. I'm afraid of heights, so even the scary sounds and shots of the lift right at the beginning are enough to terrify me. I went on a lift a couple times before, and it stopped out of the blue once, for a few seconds. I was around 13 years old, haven't felt like repeating the experience ever since. Although there have been real cases of people getting stuck on the lifts at ski resorts, some viewers still think this concept is ridiculous. Parker, Dan, and Lynch get stranded purely due to bad luck. They catch a ride on the lift just when the resort is starting to close down, bracing for approaching bad weather. The operator who sees them get on the chair has to go talk to his boss, so he leaves a fellow employee to wait for the three people who went up the mountain - and that employee thinks everything's good when he sees three other people reach the bottom of the mountain. If only Parker had stayed behind, like she suggested, A series of events put the trio in this very spot, and it is all very likely and pretty similar to what happens day to day, to everyone, everywhere. If only it had been a "guys only" trip, then Parker would've called for help the minute she realized something happened, when Dan never returned home. If only they felt satisfied and left before the "night cap". If only, if only... seems perfectly plausible to me. I think the why and how of the group getting stranded is explained well enough, but I've never questioned the realism of this scenario. People are often careless and incompetent, so I have no doubt that this exact situation could happen in real life. Sometimes it's not just even about being careless and incompetent - though that does happen too often - but people are, by nature, too self-involved. Most of the time we're too in our head to even function properly in situations like that, where a simple action could literally become life-or-death. For more than an hour, Frozen focuses on Parker, Dan, and Lynch's attempts to get off the chair and down the mountain, as Green throws one predicament after another their way. Starting with the fact that they left their cell phones in their lockers at the resort. When the resort closes down, it's not closing for just the night or to wait out the snowstorm that's hitting. Once it's closed on a Sunday night, it doesn't open again until Friday. There's no way Parker, Dan, and Lynch can just sit in the lift and wait for someone to come along and save them... Although there is a moment of false hope when when Kane Hodder cameos as a resort employee driving through the area. You really think he's going to save them, it's so close! And then no. The movie does earn extra points from me by having four-time Jason Voorhees performer Hodder play a character named Cody. While trying to figure out how to escape from this situation, the three friends have to deal with snowfall, temperatures so cold that any exposed skin will freeze to the metal of the chair's supports, and necessary bodily functions. It's not clear whether or not it's safe to jump from the height the chair is at, and the cables holding the chair up are so sharp they can cut through their gloves... But eventually they're so desperate they'll try anything. Complicating matters even further are the ravenously hungry wolves that wander out of the wilderness looking for something to eat. Frozen is the sort of movie where I'm fascinated to see how a filmmaker is able to stretch out a situation for a feature running time and keep it interesting. The characters are stuck in a chair for more than an hour of the movie, but there's never a dull moment. There are plenty of tense ones, though, and ones that will make you cringe. It's the relationship between the three of them and the non-stop dialogue. They talk about any and everything, and somehow it's all very attention-grabbing. It's a mix of nerd/cool, with references to Sarlacc Pit, Space Invaders ski board, etc. They're an interesting trio. Dan is literally stuck between Parker and Lynch, with the latter wanting more "best guy friends" time and the girlfriend wanting more romance. Parker and Dan seem to be a fairly new couple, though he's comfortable enough pimping her out to the lift guy for a discount. When Parker talks about how her dog is going to be sad and confused when she doesn't come home to feed her, that's exactly what I'd be thinking about, after a while. The characters are relatable. This is also the sort of movie that keeps you involved because it makes you wonder how you would handle being in the situation yourself. I would be pretty screwed if I were on that chair; too afraid to jump from it, with an upper body too weak to climb on the cable. I wouldn't come up with a survival tactic much better than "Sit here and hope." The first thing I'd do is wait till morning, and when that didn't work, I'd think that getting the whole chair to fall would be a better bet than jumping or trying to climb over the cables. There'd be a chance that it'd break the fall, keeping the people inside safe. But who knows how it'd go? Thinking about it and actually living through something like that are two very different scenarios. Green did a great job with the script for this film, and brought it to the screen in a way that milks every possible bit of tension and thrills out of the set-up. He also deserves kudos for actually shooting it all outside in cold, snowy conditions. There's no way I would have done that. If I had this idea and felt passionate about it, it would have ended up as a book because I'm not spending days out in the cold to shoot a movie in the snow. I've never experienced cold weather like that, and I've never seen snow. As I type this, the sun is shining so brightly outside and it's been such a ridiculously hot summer, it makes me crave for some coolness. Not like that though. Fittingly, the area I was living in at the time was hit by a snowstorm on the day Frozen was released on DVD and Blu-ray. I had intended to go out and buy the disc that day, but the storm kept me indoors. I mentioned this on Twitter, and it's the one time Green and I have had any sort of interaction. He told me, "Don't jump off the lift! Bad badness will happen. Just stay put and weather the storm." I feel like Green needs to be making more movies like Frozen. Sure, we all love the Hatchet series, but Frozen has so much more to offer. It shows how talented Green is. I know that coming up with a story like that and finding actors with the right chemistry, not to mention all of the technical and monetary aspects, is easier said than done, but still... this is the type of movie I never get tired of. It has a very high repeat viewing value, and it doesn't feel dated in any way, even though it's almost a decade old. It was one of the first Blu-ray discs I purchased. Seems like so long ago. What a great buy.